Chapter 15 of Thunderball (“Cardboard Hero”) is set in the Nassau Casino. Bond is enjoying caviar and champagne with Domino when she explains how the sailor depicted on the front of a packet of Players cigarettes (The Hero) was her first true love. 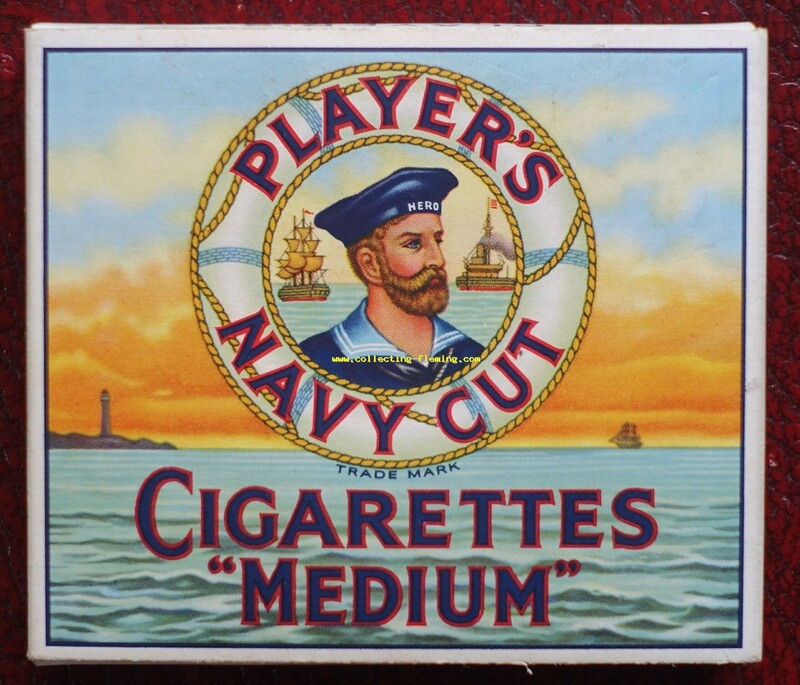 Cigarette packaging in the 1960s was very different to today. If you have a copy of Thunderball to hand then take a moment to read this section whilst looking at the artwork depicted on the packet she is describing. 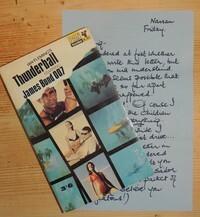 The film version of Thunderball was released in 1965 and as with the other films, Pan books took advantage by releasing a paperback with a movie tie in cover. 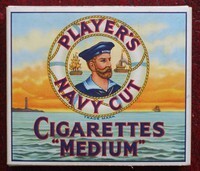 Large numbers of these were sold leading to several re-prints during 1965 and 1966. 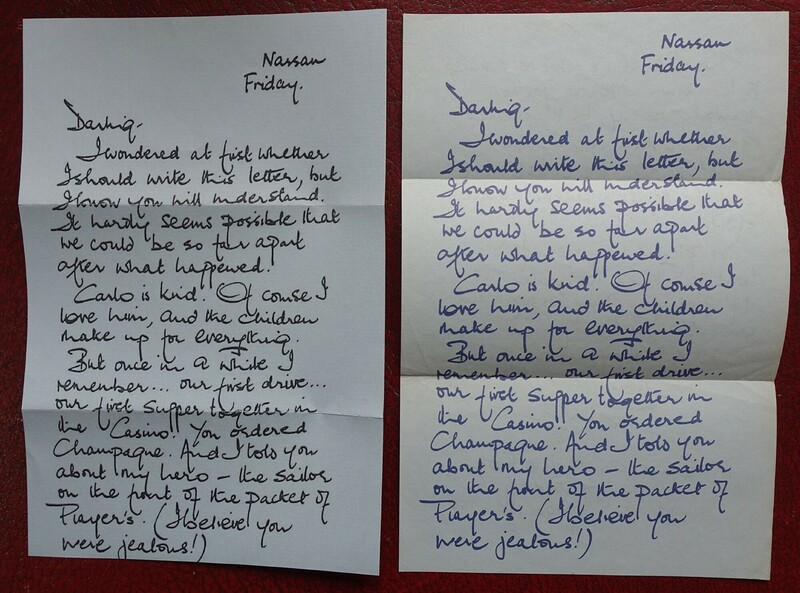 In a clever piece of marketing a promotional “letter” from Domino to James Bond was inserted within copies of the 14th edition of the paperback. The late Derek Coyte who worked with EON productions on the marketing side of the films came up with the idea and wrote the letter (many thanks to Graham Rye of the excellent 007 Magazine for supplying this fact). I do not know how many copies of the 14th edition contained the letter but most have been lost or discarded over time making them scarce. They now represent a “must have” for serious collectors. Money permitting you can of course just buy a copy – at the time of writing (Feb 2015) there are three copies of the book with letter for sale on Abebooks ranging from £550 to £625 ($850 to $1000). 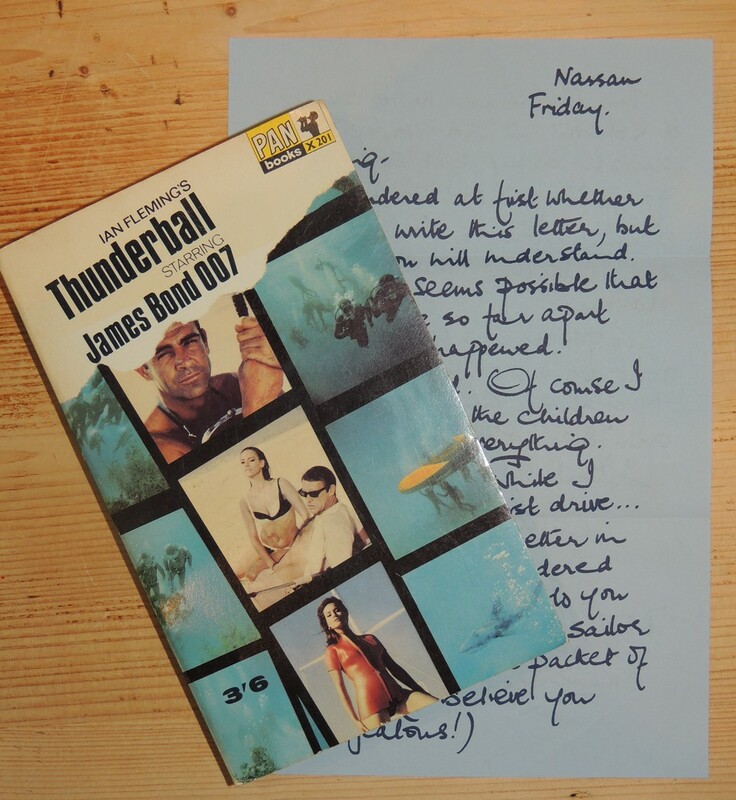 Better than buying a copy of course is to find a copy of the letter in a cheap copy of Thunderball. I remember sorting through a box of about 100 James Bond paperbacks I purchased off ebay for a few pounds, in it there were three copies of Thunderball. Flicking through the pages of the books the first two were empty, but in the third was a copy of the letter that had probably laid there undisturbed for nearly 50 years. As a collector moments like this are few and far between but the excitement of such a find is one of the most enjoyable (and profitable) aspects of the hobby. The text of the letter is reproduced in several places on the web so I am assuming it is not copyright - if someone knows differently I can remove the below. I wondered at first whether I should write this letter, but I know you will understand. It hardly seems possible that we could be so far apart after what happened. Carlo is kind. Of course I love him, and the children make up for everything. This Christmas we’re coming to London. I know you’re terribly busy, but couldn’t you just find one spare evening when we could meet and talk and laugh about old times? Do please say yes. And don’t let that horrible old ‘M’ give you any assignment over the holiday. P.S. Came across this book in Nassau yesterday. You must read pages 152 - 155. If you are lucky enough to find a copy in a cheap book or buy a copy from a reputable dealer then you can be sure you have a genuine copy. Unfortunately not all the copies sold on sites such as ebay are genuine. The problem of course is that the book itself has little value (in fact don’t worry too much about the condition of the book, finding a copy of 14th edition without the letter is easy) but the small slip of paper is worth a lot. Its more valuable than most bank notes, yet easier to counterfeit so buyer beware. The printing of the text should be in blue, the fake shown on the left is in black. Note also how the text is badly centred. The paper was folded into thirds (ie 2 folds), even if the letter has been stored flat the folds are still visible. The paper is a very thing “air mail” type paper. If lit from behind the text from both sides should be visible and you can see tiny pin pricks of light shining through the paper. Again holding up to the light a watermark should be visible. The letters were cut from larger sheets of watermarked paper so different letters have different parts of the watermark but all have at least a few letters. So far I have not come across a fake with a watermark, but even so I will not reveal the full text / design of the watermark. There are 2 further methods of telling if a letter is genuine but I will not reveal them here in case it helps those making fakes. If you want further help on checking whether a letter is genuine or not then get in touch.